Take 2 vegetables, cook them until they’re soft then blend them, and you end up with a surprisingly satisfying soup–especially if one of the ingredients is an onion, leek or shallot. Potato leek soup is popular, French onion soup doesn’t call for much more than its star ingredient, and this simple onion and fennel soup is just as straightforward. 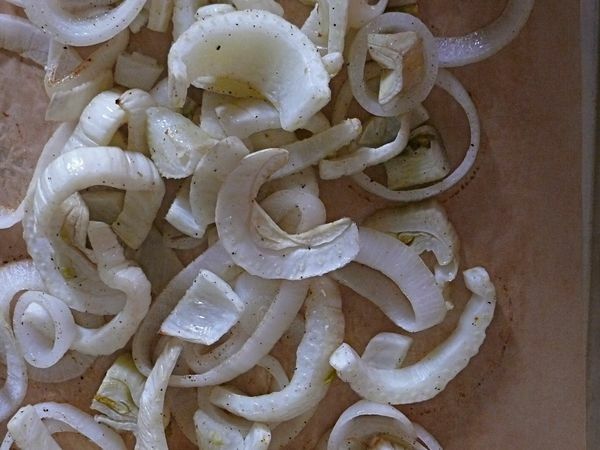 It’s little more than onion and fennel. 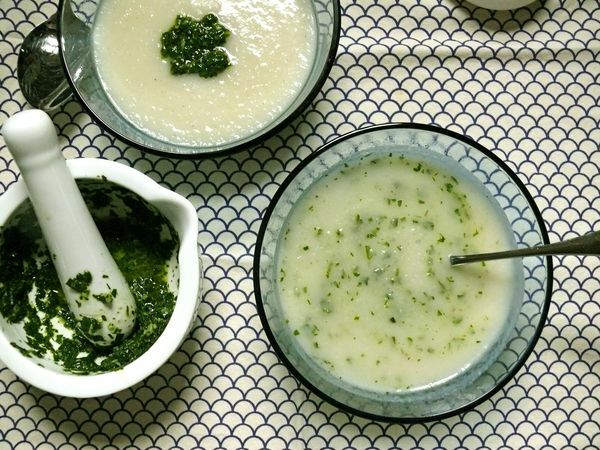 Pistou, a French paste similar to pesto but without cheese or nuts, is traditionally served on top of a thin vegetable soup. It’s probably sacrilege to add it to a creamy soup like this (mon Dieu) but so be it. It lends just the right finishing touch to both the taste of this soup, and the look too. Line a 4-sided baking sheet with parchment paper (foil works too but the vegetables may brown more which will affect the colour of this soup slightly). 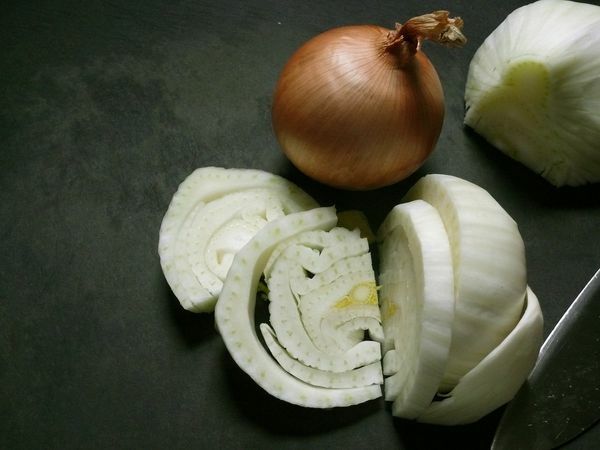 Toss the onion and fennel in the oil, 1/2 teaspoon of salt and the pepper and spread evenly on the baking sheet. Roast in oven for 20-25 minutes, checking toward the end that the vegetables are cooked but are not browning much. Meanwhile, in a mortar, add the garlic and salt and pound until the garlic is a paste. 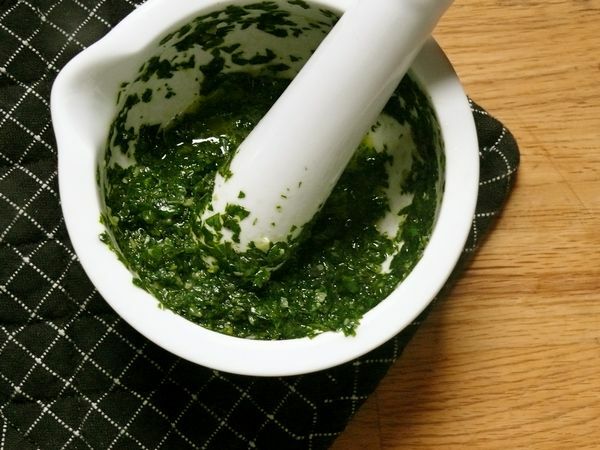 Add the chopped herbs, oil and lemon juice, and pound to a paste. Add 4 cups of water to a medium pot over medium-high heat. Add the roasted vegetables, 1/2 teaspoon of salt and bring to a boil. Remove from heat. Puree with an immersion blender until smooth. Taste and adjust seasoning if necessary–the soup should be subtle since the pistou will add flavour, but it should not be bland. 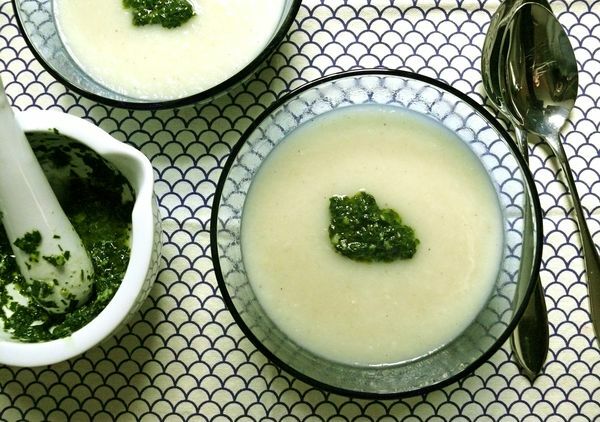 Ladle soup into serving bowls, top with a heaping teaspoon of pistou and serve. This story and recipe appear in THANKSGIVING, Issue 004 of Le Sauce Magazine.